Leaving your home abroad can be hard, but why stop your travel journey now? 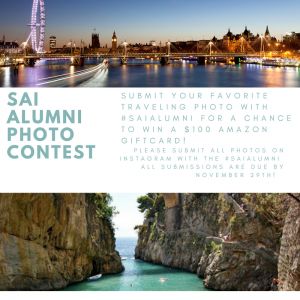 Post your favorite photo from abroad to your Instagram with a short description and include #SAIAlumni by November 29th, 2017 at 11:59 PM ET. Submissions can also be emailed to photos@saiprograms.com with a description. We can accept 2 submissions per person via Instagram, and 1 submission per person via email. Follow SAI Programs on Instagram. Top photos will be posted in a photoset on the SAI Instagram page on December 1st, 2017. Share your photo on your own social media and ask your family and friends to comment on the SAI photoset with the number of your photo (1 comment = 1 vote). The photo with the most comments on December 5th, 2017 at 9:00 AM ET will win a $100 Amazon gift card and a printed copy of their photo, while 2nd and 3rd place will receive a printed copy of their photos. Eligibility. This SAI Alumni Photo Contest is open to any SAI Alumni. SAI will verify eligibility of each entrant. Photo must be taken in an SAI Programs country (Italy, Spain, France or England). How to Enter. Participants may enter the contest via Instagram or email by November 29, 2017 at 11:59 PM ET. Via Instagram, participants should post their entry on their person Instagram page, including a short description of the photo, and use #SAIAlumni. Via email, participants should email one photo as an attachment to photos@saiprograms.com, and include participant’s full name, Instagram handle, and a short description of the photo. We can accept 2 submissions per person via Instagram, and 1 submission per person via email. SAI reserves the right to dispose of any photo that it feels is inappropriate. Winner Selection. Top photos will be posted in a photoset on the SAI Instagram page, and the photo with the most votes (Instagram comments) will be the contest winner. To count as a vote, participants must comment the corresponding number of their favorite picture in the photoset, i.e if your photo is second in the photoset, all of the comments that are of “2” count as votes for your photo! Second and third place will be awarded to the participants with the second and third most comments. Participants are encouraged to share their photo via their social networks to get Instagram comments. Voters must have an Instagram account; individuals can only vote once. Photo voting closes on December 5th, 2017 at 9:00 AM ET. Only one participant is eligible to win the photo contest. If the Instagram contest results in a tie an SAI photo contest committee will choose the winning photo. The contest winner will be announced on December 8th, 2017. Prize. The first place prize is a $100 Amazon gift card and a printed copy of the participant’s photo. Second and third place prizes are printed copies of the participants’ photos. Prizes are non-transferable. Additional Limitations. SAI reserves the right to terminate, suspend or amend the contest. By participating, each entrant releases the submitted photos and agrees that they may be used for promotional purposes. The contest winner will be posted on the SAI website and social media! Contact information will not be made public. SAI welcomes various interns throughout the summer and semester. Interns share their experiences abroad and as alums through the SAI blog.